Whenever I prepare a Middle-Eastern mezze for my friends I try to make the food experience as authentic as I can. This includes the beverages. There are lots of different drinks that can accompany a Mezze. These are tea, coffee, wine, alcoholic drinks and yogurt based drinks. Mint tea is a very popular in Morocco. It is green tea with mint leaves. Karkade is an Egyptian Iced Hibiscus Drink - quick recipe below. Rose tea is a very good accompaniment for dessert - quick recipe below. These teas can be served hot or cold. 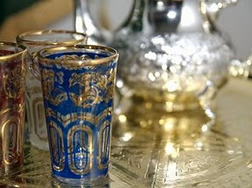 However Moroccan mint tea is traditionally served hot in small glasses, only half filled, to prevent burning fingers. Rosewater Lemonade is very refreshing - quick recipe below. 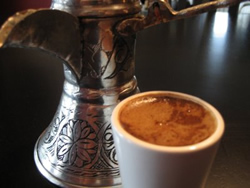 Turkish or Greek coffee would be the perfect accompaniment to any mezze. The preparation for both are the same. Finely powdered roast coffee beans (finer than espresso ) are put in a pot and boiled with sugar (add 1 teaspoon for every two teaspoons of coffee). This is then poured into a cup - unfiltered - so the grinds (dregs) settle to the bottom. Cardamom or spices are sometimes added. Milk is never added. This is an excellent tutorial for brewing Turkish coffee. If you don't own a Turkish Ibrik or a Greek Briki you can brew the coffee in a saucepan. A mezze is a combination of many dishes. Some are heady with spice and some are delicately flavored. Should you serve a red wine or a white wine? The answer is - you can serve both. Red wine - Zinfandel pairs well with relatively spicy dishes and compliments complicated spices. White wine - Roussanne or Riesling will compliment all dishes. Middle Eastern Arak. This alcoholic drink tastes like licorice. The alcohol content is very high. To drink Arak mix it approximately 1/3 Arak to 2/3 water. This pepto-bismol pink colored drink has a most fascinating flavor. It's sweet, herbal, nutty, floral and fruity. It's a super-sweet Indian beverage made with milk and a very special syrup called Rooh Afza (which is readily available in most Indian or Middle Eastern markets and online). Karkade (Iced Hibiscus Drink): 1 cup hibiscus petals (karkade), 5 cups water , Sugar to taste. Put the petals in a pan with the water. Bring to the boil and simmer for 5 minutes. Let cool, then filter into a jug and chill, covered with plastic wrap. Serve chilled. The drink is quite tart. Let everyone add sugar to taste. Note: The drink can also be served hot like tea. From "The New Book of Middle Eastern Food" by Claudia Roden. Rose Tea: 1 1/2 cups rose petals, 3 cups distilled water, honey to taste. Use fresh rose petals that are free from any pesticides. Rinse petals under cold running water and gently pat dry. Place in a saucepan and distilled water. Bring to a boil, lower heat, and allow to simmer for five minutes or until petals have darkened in color. Strain into teapot or teacups. Add honey, if desired, to taste. Rosewater Lemonade: 5 1/3 cups water. 1 cup granulated sugar. 1 1/3 cup fresh lemon juice (6 - 7 lemons) 2 1/2 - 3 1/2 teaspoons rose water. Combine water and sugar in a saucepan and heat over medium-low heat, stirring just until the sugar has dissolved. Remove from heat and cool. Stir in lemon juice and rose water to taste. Chill well before serving. Makes 6 1/2 cups. A little rose water goes a long way. I'd suggest you start with 2 1/2 teaspoons and work up from there.